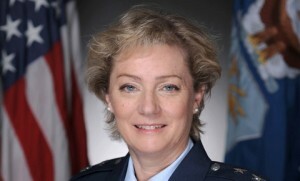 Air Force Maj. Gen. Wendy Masiello serves as the branch’s deputy assistant secretary for contracting, where she is responsible for the branch’s acquisition of weapon systems, logistics, operational and contingency support. Prior to this position, the 32-year veteran served as program executive officer for combat and mission support. Between July 2005 and January 2006, she was deployed to Iraq and served as principal assistant for contracting forces in Iraq and Afghanistan, where she oversaw contracting and acquisition support to forces in both countries. She also was responsible for security transition support in Afghanistan and humanitarian relief following an earthquake in Pakistan. Masiello earned her commission in December 1980 from Texas Tech University as a distinguished graduate of the ROTC program there. The Air Force says she has held several acquisition roles including principal contracting officer for surveillance and reconnaissance systems, weapon systems and test ranges. She also has served as an assistant professor at the Air Force Institute of Technology and executive director for the National Reconnaissance Office’s inspector general Inspector General. Staff tours included service as deputy director of plans and programs and director of contracting at two systems acquisition centers.